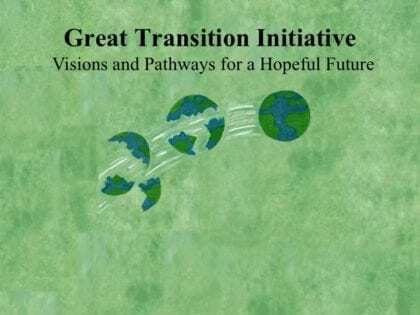 Guy Standing has just posted an article on the Great Transition Initiative website. Titled “The Precariat: Today’s Transformative Class?”, the essay describes social evolution in the last few centuries and present-day neoliberal “rentier economy”, which has created the conditions to the rise of a new social class for which Standing has named the “precariat”. Guy Standing defends that it will be through this new “precariat” that profound changes to humanity’s social organization will come about. First, because by not knowing stable employment, it does not believe jobs are the answer to insecurity, like many politicians on the Left tend to think. Jobs are, in this framework, representatives of an already falling hierarchical way of organization, which he considers contrary to human nature. Ancient societies – ex. : Greeks – for all their problems and prejudices, valued much more leisure than work, and so, nowadays, would make more sense to pursue knowledge and meaning, rather than endless consumption. For this to come about, however, a new economic system must flourish. One that recognizes ecological limits and insures basic security for all. A profound philosophical shift lies at the heart of this process, and that’s one that ceases to consider each person as a separate individual – who to have something must own it, depriving others from it – to another where interdependency and sharing are the utmost values. From there, Standing recalls that the Commons are shared prosperity between humans and should be strengthened as a way to reverse decades of neoliberal enclosure, commodification, privatization and colonization. He then devises a general idea on how the Commons should generate revenue for redistribution among all people, in a similar process adopted by some Social Funds around the world (ex. : Norwegian Pension Fund Global, the Alaskan Permanent Fund). That revenue would be derived, then, by taxing all those exploring Commons resources, such as land, the atmosphere, the rivers and oceans, even intellectual work. Since the Commons are, in principle, shared equally by all the commoners, it only makes sense to redistribute the Social Funds setup this way as an equal share to all of them, unconditionally. That’s where basic income ste ps in, as a crucial and structural piece of social policy, within this new kind of social contract. This will, according to Guy Standing, provide basic security for all, strengthen social solidarity and shift work time and energy towards reproductive, sharing and resource-conserving activities (away from resource-depleting ones).